Well now that everyone in Southern California is growing gills from all the rain, we have successfully embraced our beloved boots. However, being that finding the “right” boot is such a challenge, almost to the point of dreading it as much as cleaning the bathroom. 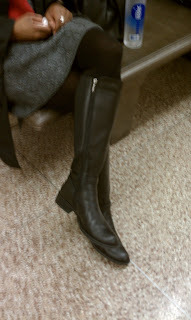 I think I truly gasped out loud when I saw these on my fellow juror last week. I was rather excited to be picked for a jury and even more excited to meet this truly fabulous woman on my jury. She first caught my eye while sitting through endless interview questions of potential jurors as she sat stylishly in the black patent Tory Burch ‘Sophie’ wedges that I featured in my last post. I knew this lady was gonna be my bestie during this trial instantly. She wore these fabulous knee high flat boots on our first official day of the trial after the jury was finalized, aka Day 2 of Jury Duty for me. I no longer could resist chatting it up with her about shoes. She’s got a dream job of working as the Director of Diversity & Inclusion for a national law firm so Ms. Thang has to turn it out with some fierce style in the office and as she jet sets all over the country. And clearly she didn’t disappoint. Super chic! great time to buy not too! OH and Nordies has a Boot sale now too! oooh Child! My name is Michelle and I work in the Marketing department at Aquatalia by Marvin K. I discovered your blog post and have to tell you this is a great story! We appreciate you featuring our product. 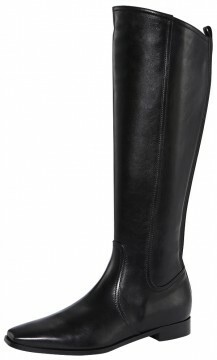 I agree, this style is chic and sophisticated, fashionable...I have these boots myself and absolutely love them! I have posted this blog post to our Facebook page - check us out!